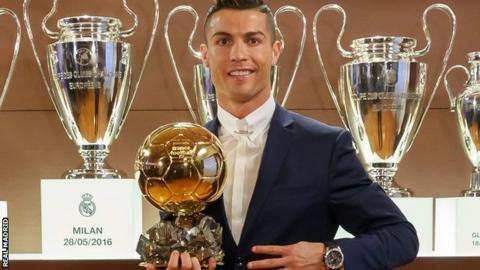 Real Madrid forward Cristiano Ronaldo beat rival Lionel Messi to win the prestigious Ballon d'Or award for a fourth time, BBC reports. The 31-year-old is now one behind Barcelona's Messi, who took the honour for a fifth time last year. Atletico Madrid's French forward Antoine Griezmann finished third in the vote. Ronaldo helped Real Madrid win last season's Champions League and scored three goals as Portugal won Euro 2016. He has now won the Ballon d'Or in 2008, 2013, 2014 and 2016, with Messi the only other recipient of the award since winning it for the first time in 2009.